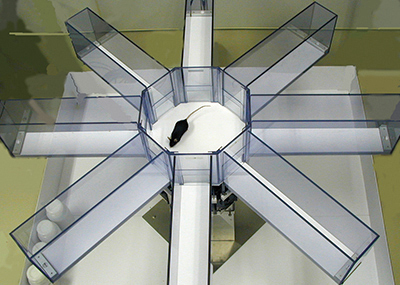 Eight-arm radial maze | O’HARA & CO.,LTD. 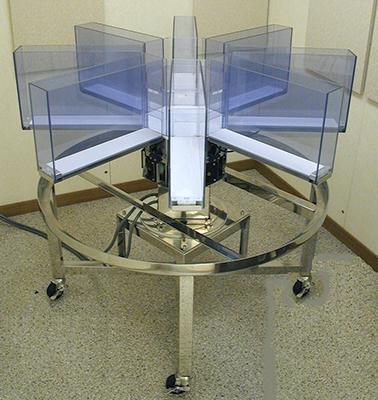 The radial maze is placed on a frame to set the final height of the apparatus to 90cm above the floor. This height is design to prevent any effects from the experimenter’s movement on the subject’s behavior. Within the maze, each arm is equipped a motor drive door that automatically opens and closes in response to the subject’s movement. Located at the end of each arm are food cups equipped with sensors to detect whether the subjects have obtained the food pellet. By using the software, all tests can be run automatically. The software includes a navigation function, which provides for a fully automated experiment. The experimenter only needs to place the subject in the maze and put the food pellet in each designated arm assigned by the software. This entry was posted in Products and tagged maze, spatial learning on 7月 23, 2015 by admin.